12 expansion joints made completely from 254 SMO and a further 18 expansion joints made from austenitic SS 316 were installed in a crude oil storage tank farm in the Arabian Gulf. Through the addition of an extra tank to its existing infrastructure the plant increased its overall capacity and sustained its production target. 254 SMO is a high-alloy austenitic stainless steel developed for use in aggressive chloride-bearing media or seawater applications. The 254 SMO is characterised by its high chromium content, this is further complemented by its molybdenum and nitrogen content which gives 254 SMO excellent resistance to pitting and crevice corrosion. Since these oil storage tanks are located in the Arabian Gulf (saline conditions) the use of this material was an optimal solution for the environment. In addition to this, the coating of the flanges was also specially selected due to its protective qualities. As corrosion is an important issue in off-shore applications, the expansion joints were painted with a three layered, two component Epoxy paint, giving a total Dft. Of 300 mm. On top of the primer a two component polyurethane high glossy coat was added. This provided a robust protective coating in the severely corrosive atmospheric environment. The applied paint offers maximum corrosion protection in the saline working environment, guarantees the lifelong positive visual appearance and has no need for additional maintenance. Belman are experienced in working with a wide range of materials. 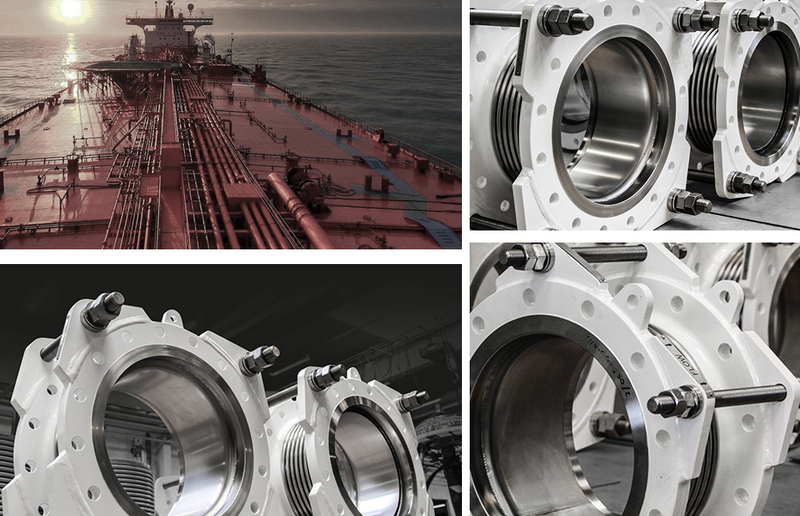 We hold references for both Inconel, Incoloy, titanium, nickel, Duplex, Alloy 59 and Hastelloy expansion joints. Additionally, Belman has a huge stock of raw materials to ensure short delivery times. We stock all kinds of stainless steels, Incoloy, Inconel, titanium and more.